… It draws upon the essential news reporting of America’s finest journalists. And it is rounded out by tales of whistleblowers and administration turncoats—by the firsthand accounts of former Treasury Secretary Paul O’Neill, ex-counterterror czar Richard Clarke, and, yes, Colonel Wilkerson. The Timeline is searchable by Icon/Tags that include “True Intel,” “False Intel,” “Torture,” “Contractors/Profiteering,” “Mission Accomplished,” and “Quagmire.” Within each entry are hyperlinks to supporting documentation. Their Flash Enabled webpage is available HERE. 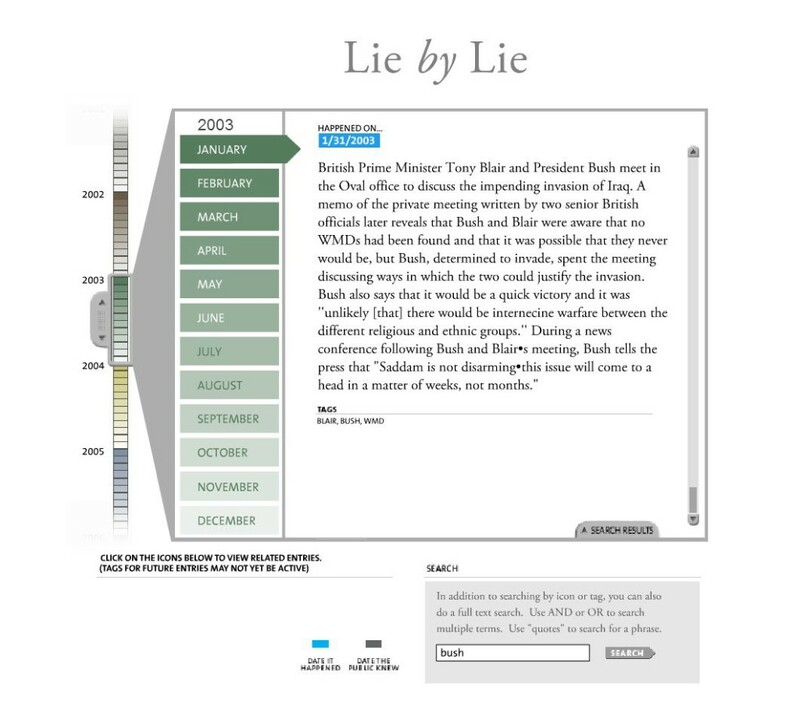 There was also a text-based timeline, up to the date the Iraq War started, available here.